Tandem kayaks (often referred to as just ‘tandems’) are for those who are a little more social. Hey, we’re not saying that having a solo ‘yak means you don’t have any friends or that someone special in your life! It’s just that paddling with another person on board is a great way to share that perfect paddling experience. Tandem kayaks are, as you would expect, generally bigger in size, compared to their solo counterparts. They fit two paddlers and sometimes have a spare section (for a dog or small child) turning them into 3 person kayaks. There are many pros, and a few cons to tandem kayaks. Deciding on whether or not a tandem is for you is going to depend on many factors. There is no hard fast answer here. It’s all going to come down to the preference of the kayaker! However, what we can do is give you as much information as we possibly can to help you get closer to making that final choice! How about we start off with highlighting the advant﻿﻿ag﻿﻿es and disadvantages of owning a tandem kayak. This is one of the more obvious pros to owning a tandem. If you have a family, particularly with younger kids, then having a tandem is a must. Depending on the age & size of your kids (make sure you are confident they can be trusted in the cockpit), you can paddle as an adult and child together. It’s best to have the child sitting in the bow cockpit (front seat) and the adult at the stern end (back seat). With this set up, your kids can sit at the front and gasp in amazement as the views unfold. While all the time, you can paddle at the back, still see everything, and look out for any obstacles that may crop up. If you have one child and a couple of adults, you could consider purchasing a separate solo ‘yak. Best to have an adult in that solo kayak, especially if you have younger kids. Always make sure you have your little ones within arms reach. And ensure you set some good, common sense ground rules before you set off (no standing or leaning etc). It goes without saying that safety should always come first! If you have 2 or more kids, then mix and match the kayaks. And as we said previously, make sure the younger kids are not paddling solo. A lot of tandems have a third space for someone smaller. Some can have a seat fitted in this third space, some not. It’s possible for a child to squeeze in here, or perhaps a dog. Just be really careful. This position may mean the person is more exposed to the elements. Something you want to avoid if the person is not 100% competent….like smaller kids for example. Paddling a tandem can just be ‘easier’! When paddling a solo kayak, everything is down to you and you only. Need to paddle over here, or over there? Well, it’s all down to you! No-one else is going to take any of the strain for you. With tandems on the other hand, it’s possible to take short breaks while the other person paddles on. Shhh! The person sitting in the stern position may be able to rest a little more as they are out of sight, hehe. Tandems also get the big ‘thumbs up’ for those who are multitasking. For example, if you’re paddling along a picturesque river and have a camera, you’re probably going to want to take some snaps. Having 2 people on board means that one can steer, while the other sets themselves up for the perfect shot. Fishing would be another example. If you’re trying to reel in a big fish, you’ll want someone else on board to keep things steady. If you want to pick up the pace, then a tandem is the way to go. Of course, there are two of you on board, so with teamwork you can really power ahead. 2 persons, along with the fact you’re paddling a longer boat, means you can tour along faster. Even taking into consideration that the stern is wider on a tandem, theoretically, you should travel faster through the water. Now speed isn’t necessarily an advantage. If you’re enjoying the beautiful scenery on a tour, then speed is probably something you don't really care about. We have, however, put it down as an advantage. There are some racy paddlers out there after all! Stability can be key, particularly for less experienced kayakers. Think beginners, and of course, children. If you lack experience, you may be looking for stability over speed – something we would recommend. Stability is also important in choppier or less calm waters. The more stability, the better. You may want to consider a tandem kayak with a rudder and pedals for easier control. Tandems can be a little more difficult to manoeuvre than solo ‘yaks. This is purely subjective! Sometimes the paddling experience is just more fun with two people. You can share the moment much easier than if you were in separate ‘yaks. Sitting together, it is much easier to have a conversation and talk about the views and the overall experience together. You can share those ‘look at that!’ moments much more easily and intimately in a 2 person kayak. This is especially the case if you are with your wife/husband/partner. It is obviously so much more romantic to share the ride with your loved one than paddling separately. More spacious (but 2 single/solo kayaks usually carry more than one double). As tempting as it is, try not to bring too much gear with you. Yes, tandems can take a lot of heavy gear. But the more that’s carried, the more difficult it is to get around and the harder it is to paddle. Kayaks tend to be so much more sluggish when nearing weight capacity. This is another reason why two solo kayaks are better than a tandem should there be a need to carry around more stuff. If you can carry less – do so. Your paddling experience will be a whole lot more enjoyable as a result. This is something to really think about. Whether you just have the one tandem for 2 people, or you’re out with a group…having at least one tandem kayak is a great safety backup. If you’re out with a group and someone falls ill or tires out, you have the spare seat in the tandem for that person to relax and let the other paddler do all the work. If you’re out with a bunch of solo ‘yaks, then how is that person going to get to their destination? A solo kayak would have to get towed, with that person on board. Not particularly practical, although possible. Yup, why not take the dog with you! As long as they’re happy enough, a “man’s best friend “ can be great company if you’re going out for a tour. We recommend looking for a ‘yak with removable seats. This will leave as much room as possible for ‘Fido’ to get comfortable and enjoy the ride as well. This is probably the biggest disadvantage. Tandem ‘yaks are just bigger and more cumbersome than solo kayaks. This means you need to think about storage and how you're going to move the kayak around. Have you got enough space to store a large kayak? Is your car capable of carrying around your bigger-than-average kayak? These both need thorough investigation before any purchase. Tandems also tend to be heavier. Well, the hard shell ‘yaks are at least. With all this weight, can you easily lift the kayak onto the car? One strong (relatively speaking) person should be able to do this alone, but really it’s a 2 person job. Keep these points in mind! As we said before, a tandem ‘yak is ‘roomy’, but 2 solo kayaks are a better option if you plan on lugging around lots of equipment regularly. There is no golden rule on this, as it’s going to depend on a number of variables. Just measure up all your options before making any decision. We explained earlier how a tandem can be good for sharing the experience. Well, yes, we still stand by that. But sometimes tandem kayaking can cause friction between two paddlers. Particularly if there is a great difference in fitness levels and in expectation from the kayak tour experience. One person may want to paddle slowly down one side of the river, while the other might want to go ‘all out’ down the other! There’s also a loss of independence. If you’re paddling solo, you can go anywhere you want and as fast as you want whenever the moment takes you. Tandems mean teamwork. So if you have an independent thinking mind, sharing a ‘yak may not be for you! The Ocean Kayak Zest Two is a tandem sit-on-top that’s built for touring. With its stable hull, it can handle a range of water conditions and could be a good choice for a family camping trip. Because of its relatively narrow width compared with its long length, the Zest Two is designed for speed and efficiency compared to some shorter, wider yaks. This can make it easier to paddle over longer distances. The yak comes with two padded seats with seat backs that fit in the two molded seats in the hull, but there’s also room for a small third passenger or dog. There are spacious storage areas at the bow and stern, both with bungee cords for securing gear for an overnight trip. This is a pretty long vessel, which may require additional transportation considerations and a strong second paddler to help lift it. The Old Town Twin Heron is a tandem sit-inside yak that has one large, spacious cockpit with two seats and adjustable seat backs. The design of the cockpit can also mean you’re able to paddle it on your own if you need to. And to help with this, there’s an Auto Trim Hull, which redistributes the weight when paddling solo, so it shouldn’t affect the performance or cause the yak to tip. With a 500 pound capacity it can be a great choice for larger solo paddlers or if you want additional storage capacity. If there are two of you paddling, you should also still have room for light camping gear and there’s the benefit of having additional bungee storage space at the stern. The Straitedge 2 is an inflatable tandem yak that could be a good option if you want the freedom to be able to take your vessel with you wherever you go and not have to find dedicated storage or transportation methods. It has an aluminum frame at the bow and stern, which can help with performance, particularly tracking on open water but it can be ideal for a range of water, from lakes and bays to rivers and up to Class 3 whitewater. Another feature of the Straitedge 2 is that it has built-in rod holders, which means it can be ideal for a fishing trip. It comes with two padded seats with adjustable seat backs but it’s also possible to reconfigure the seats to paddle it solo from the center. This ever-popular kayak seats 2 paddlers comfortably. You could also fit a smaller child in the center making this a 3 person kayak. Up to 425 pounds of weight in total is supported. It comes with two Comfort Plus seats that can be inserted in two of the three molded seat wells. Along with the 3 wells comes several foot wells so your leg length should be catered for. It’s a hard-shelled ‘yak so of course won’t store away compactly, like some of the inflatable tandems in the list. Best suited to relatively flat waters. Rough waters can make the Malibu Two a bit of a handful to control, which could prove tricky for beginners. Note that paddles are not included with this product. Another of our inflatable offerings. The Sea Eagle SE370 comes packed with a pump, 2 inflatable seats, paddles, and a repair kit, should you have the misfortune to puncture your kayak. Made from polykrylar, the SE370 is very durable for an inflatable. It manoeuvres well, even when paddled by one person. Customers have reported that they use it as a solo ‘yak and use the rest of the space to carry huge loads and/or pets! Just be careful in rougher waters or if the wind is up. This is when 2 paddlers are better than one. Our high-end inflatable offering is the Colarado tandem ‘yak. You may be wondering why pay the extra money? Well, aside from the fact that this tandem is particularly robust, it has a number of fittings that allow for chance of expansion. For example, there are fitting for a trolling motor. There’s also paddle holders and rod holders. So yes, you guessed it, this kayak is perfect for the fishermen among you. Of course, there are seats included and it is easy to carry around courtesy of its D-rings. Going back to the robustness. This tandem is made from rugged 18-gauge PVC. Even if you did happen to get a puncture, the kayak has several air chambers, so only a certain area will leak in water, rather than the entire ‘yak sinking. Nice. Downsides are that is does not come with a pump or paddles. So you are going to have to factor that extra cost in if purchasing. This is another hard shelled PVC offering. 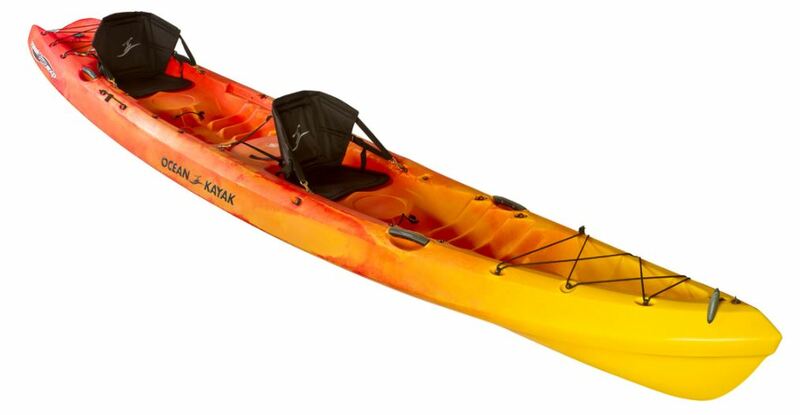 Relatively lightweight at 60lbs, this ‘yak comes with two paddles and two soft backrests. The backrests tie onto the kayak and sit on top the molded seats. There’s actually 3 molded seats, so a third person (preferably small) can sit in the center, between the bow and stern seating positions. Along with paddle cradles, there’s a handy little cargo storage on the bow. Note that it’s not an enclosed area, the cargo is held down with shock straps – but we still welcome this addition. Oh, and there’s a bottle holder. Hmmm, now is that for water…or beer? The cargo area could be used to hold your fishing gear. Just as well then that there’s also rod holders included as well. Carries up to 500 pounds in weight.